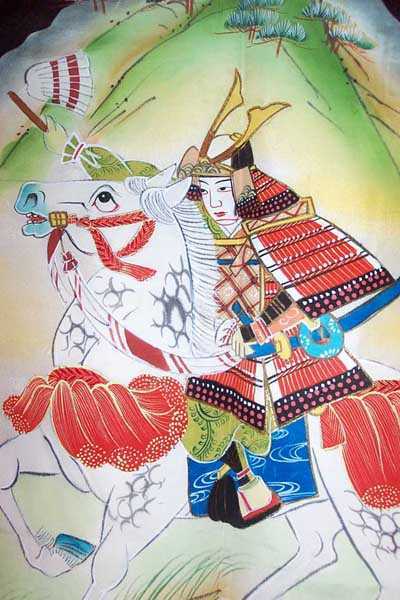 The kimono is made of the finest silk that has been hand painted in the bold design of a Samurai warrior on horseback. The design includes mountains and pine trees in the background. There are battle flags in the distance. Free hand Yuzen is the ultimate in kimono decorating. 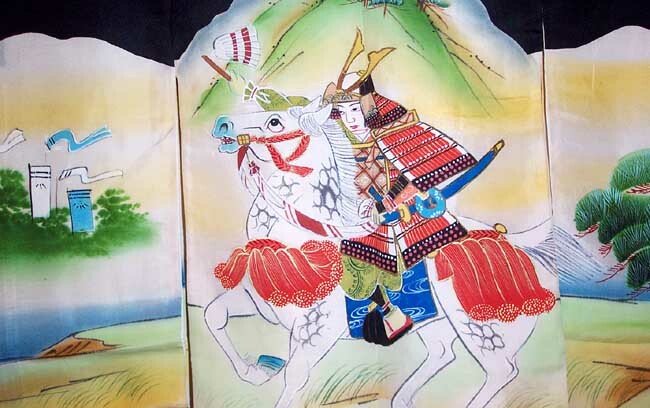 About thirty days after a Japanese baby is born, it is taken to the Shinto shrine for its first shrine visit. 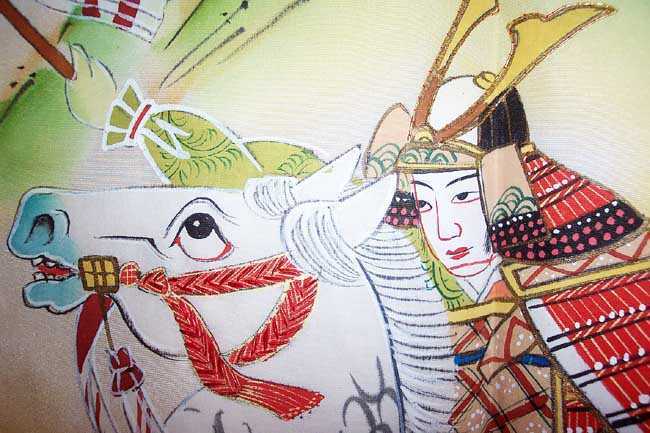 This occasion is called miyamairi and the kimono used for that day is a special garment. The event is comparable to our christening. The miyamairi kimono (christening dress) is actually draped around the infant while the kimono’s ties are loosely draped about the mother’s neck. Miyamairi is the formal event by which the child becomes a parishioner of a Shinto shrine. This antique kimono is fully lined. 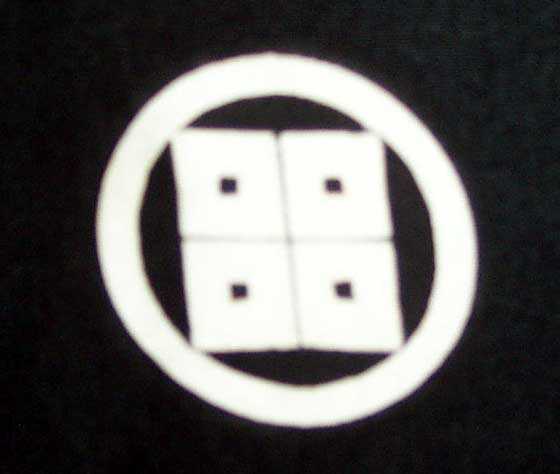 it has five family crests in the meyui (four square eyes) motif. 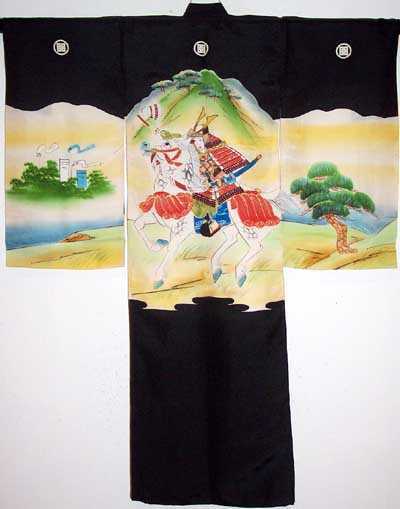 The Kimono is in Excellent Condition. Dimensions: 33” Wide from sleeve tip to sleeve tip X 39” Long from shoulder to hem.